Multiple Features in One Valve – Most coils have a temperature control valve and a balancing or flow limiting valve. Two valves means two manufacturers and two distributors. Griswold Controls provides a single source for both valves, for less hassles and less headaches. And for an added feature, the Automizer® has an integrated isolation ball valve so it is the entire return side of the coil in one valve. Griswold Controls has combined the equal percentage control of the Optimizer® insert with the precision of the Griswold Stainless Steel Flow Limiting Cartridge in the Automizer valve. The Griswold Controls Flow Cartridge limits flow from exceeding coil’s specification, while the Optimizer® creates a smooth, responsive flow curve when the valve is actuated. 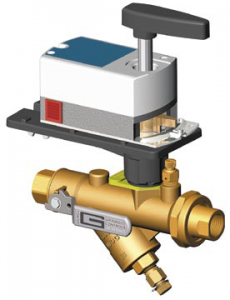 Automizer® and Balance Zone valves are ideal for schools, office buildings, VAV boxes, fan coil units, heat pump installations, and terminal boxes.